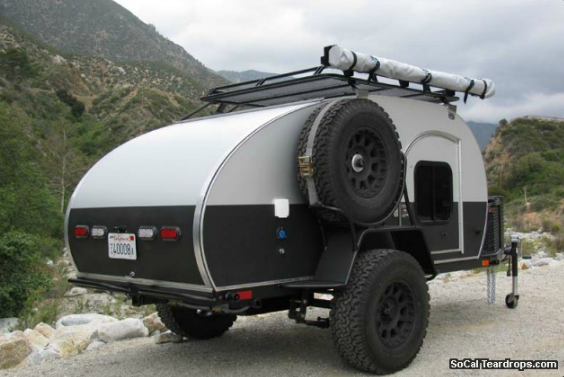 So-Cal Teardrops has an interesting off road trailer. The “XS“, is built for an off-highway adventure. The XS’s frame is built of 2″x3″-.120 wall steel tubing. Equipped with heavy duty Old Man Emu leaf springs, sprung under a 3500 lb axle with 10″ electric brakes and 9-way adjustable Rancho RS9000XL shocks. Tongue can accomodate a front storage box and two 5 gallon gas/water can holders. Hubs are spec’d to match your vehicle’s wheels and tires. The XS’s cabin is built with a reinforced rib system to combat the extra forces seen when traveling off-road. Without adding any options, you only need to provide some bedding and a cooler and you are ready to go out on any adventure. The full size 4” thick mattress provides plenty of sleeping space for two adults and the cabin is outfitted with an AM/FM/CD radio, cabin light, 12v outlet, cubbies, shelves and cup holders. The galley comes standard with the same kitchen spec’d in our road-going trailers, a 2 burner propane stove mounted in a sliding drawer with nested sliding utensil drawer. The 12v system is powered by a group 24 Interstate deep cycle battery, an on-board 3 stage marine charger with external shore power keeps the battery healthy when in storage. Though the standard configuration can support almost any trek, we build each trailer to satisfy it’s new owner’s individual needs and concerns. Looks good, but it is just one more thing to worry about … Can I fit here?, Can I leave it here and find it when I return?, Will there be room to turn around on a single lane road?, Will I crash into trees on sharp turns? Too many concerns. More expenses, with having to grease the wheels and buy new tires. More maintenance on another battery. Too much for a minimalist truck camper, but neat design. This entry was posted in Camping, Truck Camping Choices and tagged So-Cal teardrop, tear drop, teardrop, trailer. Bookmark the permalink.